1 To some, Riel may be a national hero. To others, he seemed like a raving lunatic. No matter how you see Louis Riel, he was completely dedicated to his people, the Métis. 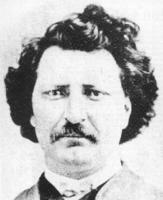 2 Louis Riel was born in Canada's northwest in 1844. His family helped form the backbone of the Red River Métis settlement. Riel was obviously intelligent from the time he was a young child. When he was 13, he was sent to school in Montreal. There he began training as a Roman Catholic priest. 3 When Riel was 20, his father died suddenly. Money to pay for his schooling dried up, and he lost any desire to continue his studies. He tried working for a lawyer but found he did not care to study law either. 4 Instead Riel left Quebec, taking work in Chicago, Illinois, and St. Paul, Minnesota. He finally returned to Red River in July 1868. By then, he had been gone for more than ten years, and things had changed.